Suspected broken ankle. Looks horrible. 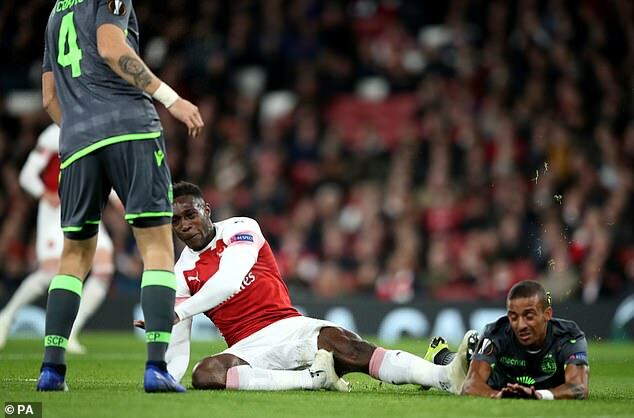 Welbeck can't just catch a break from injury. That looks horrible. Wishing him a speedy recovery. Godspeed - wishing him the best!!! I've come to the conclusion Henrikh's a confidence player - his performances @ManU & theemirates look alien when one looks back to his Shakhtar & Dortmund days. At Manu i think he suffered from the presence of big personalities like Zlatan & Pogba eventhough they share the same agent. But at Arsenal he's morphing sadly into Hleb @Barca - we do have ex-teammates from Dortmund though - ones he's friendly with. I think we need to play him back to confidence(crazy but bear with moi) - Aaron should be played less & hope Henrikh gets into a groove with matches - it also gives us an opportunity if he stays performing poorly to listen to offers in the summer. Ramsey's a lost cause & happy separation. I must say though I disagree - The game is leaving his body too, one issue is confidence and the other issue is physical delivery, with these two hurdles and youngens like the Rowse guy who thinks he is de bruyne , I fear Mikhi is toast. I dont like comparing , but watched a villareal game recently just to see Santi and while he is not fast and a hustler ( Mikhi actually hustles but he just bounces off whomever he is trying to tackle ) , the way Santi uses his body and his brain is a beauty to behold !! You would think from being out so long... Mikhi needs to watch Santi and tapes of Xabi Alonso and change his game. Leave the hustle part and apply the brain part some more. It will take a bit , but he can do it.. Let Ramsey be hustling , na im game be that. I hope Arsenal do right by Welbeck and give him a years extension. You know if Wenger was there, Welbeck would be given a chance. Hmmm have they given Kos an extension ? So leave Wenger ( How does looking back and what Wenger will do help in this situ ? ) out of it , you have to look forward at the pedigree of those making the calls today..
Wenger gave Santi a 1 year extension after he got hurt. Wenger was already out the door when Kos got hurt. Wenger gave Diaby, Rambo, Van Persie, etc contract extensions while injured. I know, it does NOT make business sense, but Wenger was more than that. I am just making a statement bro. Nkume, you and this your Wenger sef... even Waffi don cool down adjust, ah ah! Not sure this helps your case pal. In the NBA, Gordon Hayward suffered a similar injury least a last year and he's back on the court now. So did Paul George. God let this not be true oooh,but this Wilson why he go come post something like this on twitter?E don become Trump? How is this helping your point dude?Wenger is gone and allow that to sink in your head.Arsenal is a business not charity besides Welbeck not a good player that should be hoping to keep..Hope he get well and continue his playing. This is why you've Insurance coverage - he was injured doing his job - a job he'll be heavily insured for. To be selected to play for Arsenal at a high level must be devoid of emotion. Injuries happen - we just have to make sure people aren't screwed over by their Insurance companies. & Eto'o did comeback to the highest level looking special. In this day & age - Medicine's so advanced but we've to support Danny thru the mental hurdles - too many injuries for a young clean living dude - enough to create self doubt & insecurity - a day @atime!!! Wishing Danny all the best. for Arsenal for Danny Boy.